Read more in this blog interview. Kim A. Flodin’s artwork, which is marketed under the name Keleki Love, glows with color, energy, excitement and healing and has been described as “psychedelic” and “inspirational”. As an energy healer and intuitive, she says she can feel the healing flowing as she creates the art. The art definitely has been a healing for her at a time when she needed it most. 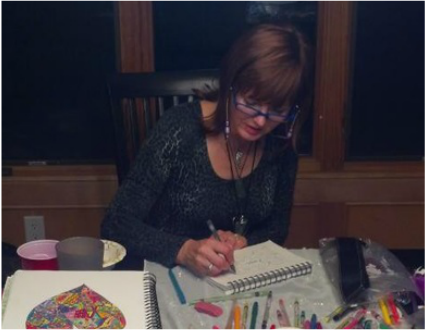 ​In late 2012, in response to a difficult living situation, she began looking for a hobby and stumbled upon Zentangle, which sparked something. She put pen to paper and hasn’t stopped since. She looked at a few Zentangle resources on the web and loosely practiced a few patterns, but never became enmeshed with it. She doesn’t know the names of the patterns she uses, nor does she concern herself on with pattern ‘technique’. According to her, it just happens and most often not in how she thought it was going to. Kim’s art continues to evolve. She's now offering an assortment of coloring books for adults, including her best-selling Sweary Mandalas, which can be found on Amazon.